With confident courage claiming the victory! May I die fighting with limitless courage!" Sikhism Originated in the Punjab in India, an extensive plain through which flow six large rivers. Between this spreads good farmland. The original name of the area was Sapta Sindhva, or "the Land of Seven Seas". The seventh river, the River Sarasvati, dried up. The name Panj-ab (i.e. the Punjab) means the Land of Five Waters. The sixth river, the Indus, is not counted because if forms the boundary with the neighbouring land. In climate, the Punjab is cold in winter and hot in summer. The time for spring and blossom is in February. Between April and June it is scorching hot and then the rains come, ushering in a time of great happiness and joy. The main produce is cane sugar, cotton and wheat, but we now can find rice, millet, maize, indigo and pulses. The Punjab is thus a rural state, covered with farming communities. A central forest used to be full of wildlife, but this has now been wiped out. Where the forest used to be is now desert, an all too common modern creation. The beginning of civilisation in India was in or around the Punjab - the so-called Harappa culture at Mohenjodaro, a rich prehistoric civilisation. To the influence of Hinduism and Buddhism was added that of Islam, after the Punjab was conquered by Muslims from 647 A.D. onwards. This was in one of the earliest phases of Muslim expansion after the death of Muhammad. There was in addition a Mongol conquest in l398. Therefore the Punjab is racially very mixed. It was also an area of constant conflict, since it formed a buffer against Afghanistan. We find in this area historically, the influence of Indian languages, philosophies and religious practices, Arabic, Persian and Turkish, and the religions of Islam and Zoroastrianism. There has always been a spirit of nationalism in the Punjab. The farming villages were linked through kinship and ruled by five elders. No central authority ever succeeded in harnessing them, and the spirit of freedom remained. The farmers, or Jats, were workers and warriors and tended to look down upon the Brahmins, the Hindu priests, as beggars; and on the Hindu Kshatriayas, or warriors as mercenaries. Throughout history, the Jat farmers had to defend their farms at any time against a host of enemies. 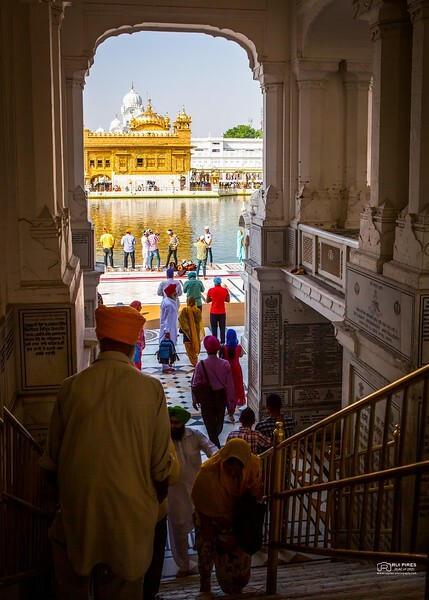 "Sikhism was born out of wedlock between Hinduism and Islam after they had known each other for a period of 900 years, but once it had taken birth, it began to develop a personality of its own and in due course grew into a faith which had some semblance to Hinduism and some to Islam and yet had features that bore no resemblance to either"
Sikhism could never be identified with either Hinduism or Islam, and was not in any sense an attempt to combine the two. The stories of the first Sikh Guru, Guru Nanak, show him pointing out the weaknesses and fallacies of Hindus and Muslims alike. He complained that the heart or essence of a faith was too easily obscured by inessential trappings, such as rituals and customs, which might continue for their own sake and not for the sake of the meaning they once symbolised. Let a pure mind be your paper, make love your pen, and your heart the writer. Write as God your teacher tells you; write his name and his praises. However far you go, God is there. However deep you dive, God is still there. He is absolutely great, and is beyond description. 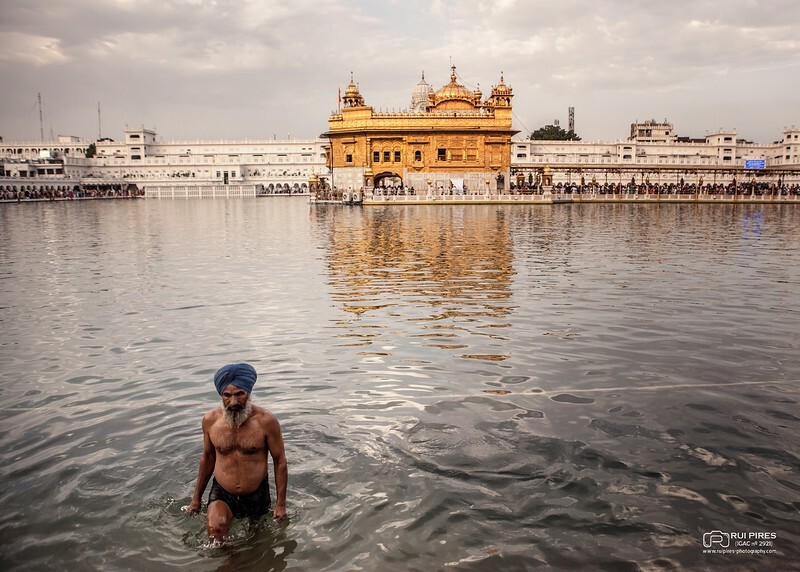 Sikhism grew out of an Indian background from the l5th century C.E. Sikhism's founder was Guru Nanak (1469-1539), although the writings of earlier theologians/holy men such as Kabir are also treasured. The worship of one God was important in this strand of Hinduism, a view strengthened by Nanak's early education in Hindu and Muslim schools. 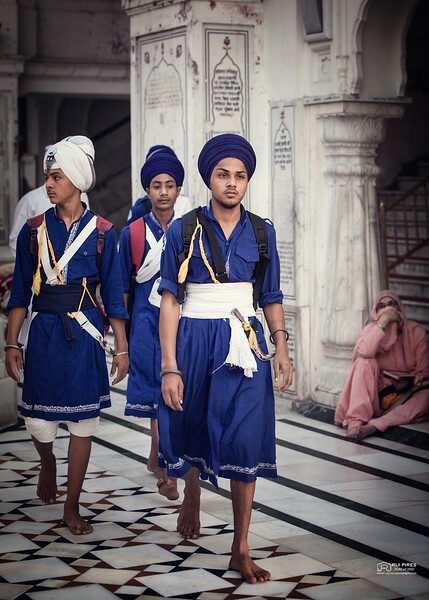 For Sikhs, the concept of God is non-personal, and expressed particularly in the language of "truth". This is in line with the Hindu philosophical tradition. There is here an analysis of the question "What is God? ": the answer is sought deep in the human soul rather than in any doctrine. Nanak was born in Talwandi (the Punjab) in 1469). The Punjab was an area in which Hindus and Muslims naturally mixed. The historical material on Nanak is mostly poetry and hymns, with little biographical material, but there were four biographies called Janam Sakhis (Life-evidences) dating from much later. He is revered as the founder of the Sikh faith and the first teacher ("Guru"), but not worshipped as God. His father, Kalyan Chand (or "Kalu") kept tax records for a Muslim official, and had a smallholding. His mother was called Tripta, his sister Nanaki and his brother Lalu. Stories tell how, as a baby, he had a marvelous horoscope: "He will worship and acknowledge but One Formless Lord and teach others to do so". By the age of 7 months, he could sit in the lotus position like a yogi. At school at seven years old, Nanak wrote an acrostic poem about "learning" and was noted by Hindus and Muslims alike for his wisdom. With a Hindu teacher, he learnt Sanskrit and the Hindu scriptures. 9 Moving to the Muslim school when he was nine, Nanak learnt Arabic and Persian, and soon began to write poetry in Persian. He was born into the Kshatriya (warrior/ruler) caste, but came to despise the whole caste system. At eleven, a story tells, he was forced into the Hindu "sacred thread" ceremony, in which high caste boys put a thread over their shoulders as a mark of initiation into their caste. 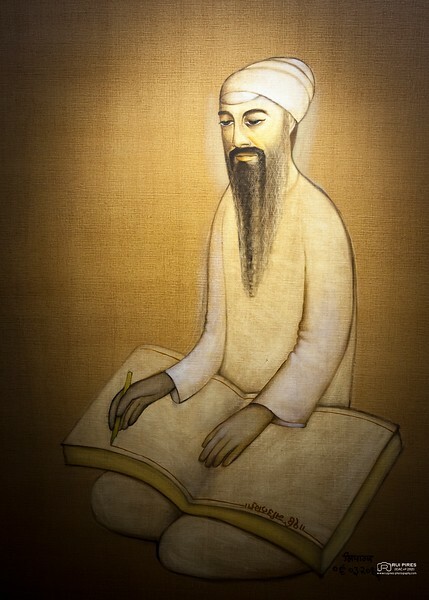 Nanak’s teachings can be found in the Sikh scripture Guru Granth Sahib, as a collection of verses recorded in Gurmukhi. There are two competing theories on Guru Nanak's teachings. 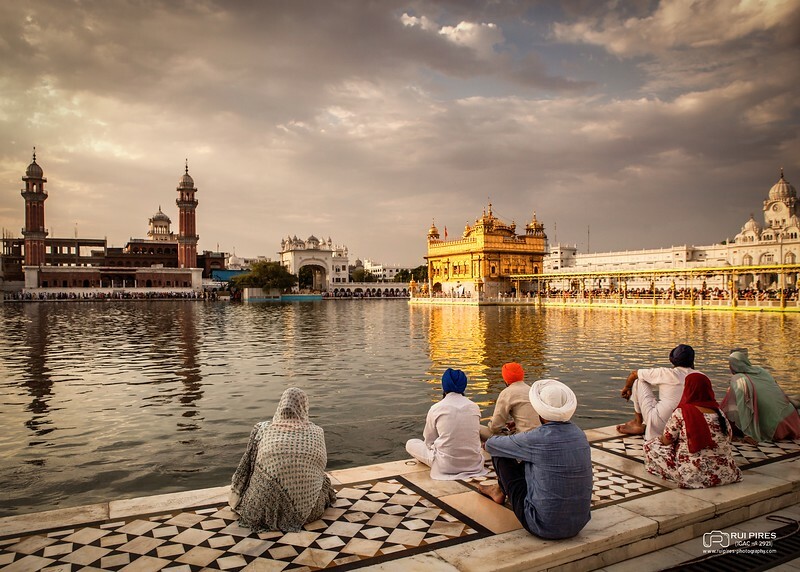 One, according to Cole and Sambhi, is based on hagiographical Janamsakhis, and states that Nanak's teachings and Sikhism were a revelation from God, and not a social protest movement nor any attempt to reconcile Hinduism and Islam in the 15th century. The other states, Nanak was a Guru. According to Singha, "Sikhism does not subscribe to the theory of incarnation or the concept of prophethood. But it has a pivotal concept of Guru. He is not an incarnation of God, not even a prophet. He is an illumined soul." The hagiographical Janamsakhis were not written by Nanak, but by later followers without regard for historical accuracy, and contain numerous legends and myths created to show respect for Nanak. The term revelation, clarify Cole and Sambhi, in Sikhism is not limited to the teachings of Nanak, they include all Sikh Gurus, as well as the words of past, present and future men and women, who possess divine knowledge intuitively through meditation. 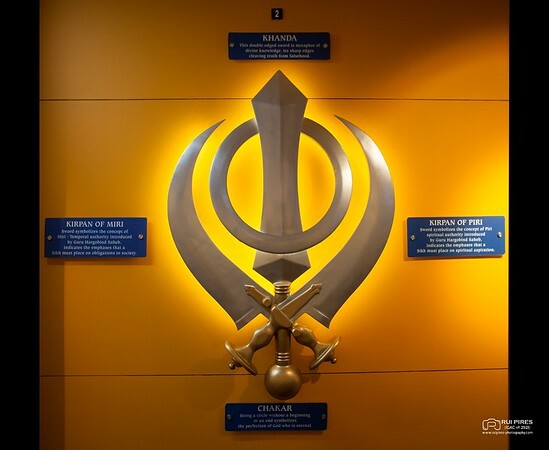 The Sikh revelations include the words of non-Sikh bhagats, some who lived and died before the birth of Nanak, and whose teachings are part of the Sikh scriptures. The Adi Granth and successive Sikh Gurus repeatedly emphasised, states Mandair, that Sikhism is "not about hearing voices from God, but it is about changing the nature of the human mind, and anyone can achieve direct experience and spiritual perfection at any time". Guru Nanak emphasised that all human beings can have direct access to God without rituals or priests. The concept of man as elaborated by Guru Nanak, states Arvind-pal Singh Mandair, refines and negates the "monotheistic concept of self/God", and "monotheism becomes almost redundant in the movement and crossings of love". The goal of man, taught the Sikh Gurus, is to end all dualities of "self and other, I and not-I", attain the "attendant balance of separation-fusion, self-other, action-inaction, attachment-detachment, in the course of daily life". Guru Nanak, and other Sikh Gurus emphasised Bhakti, and taught that the spiritual life and secular householder life are intertwined. 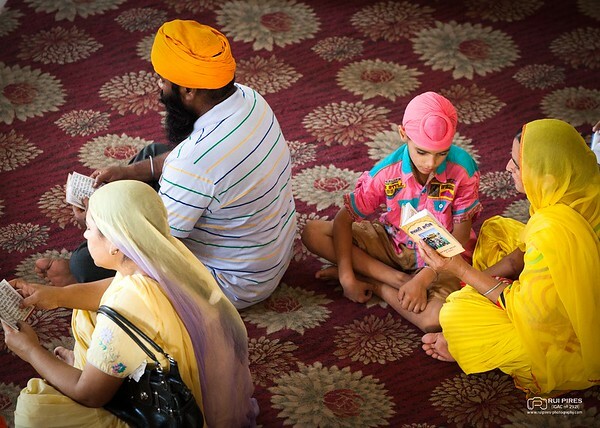 In Sikh worldview, the everyday world is part of the Infinite Reality, increased spiritual awareness leads to increased and vibrant participation in the everyday world. Guru Nanak, states Sonali Marwaha, described living an "active, creative, and practical life" of "truthfulness, fidelity, self-control and purity" as being higher than the metaphysical truth. Naam Japna: Meditating on God's name to control the five weaknesses of the human personality. Guru Nanak emphasised Nam Japna (or Naam Simran), that is repetition of God's name and attributes, as a means to feel God's presence. 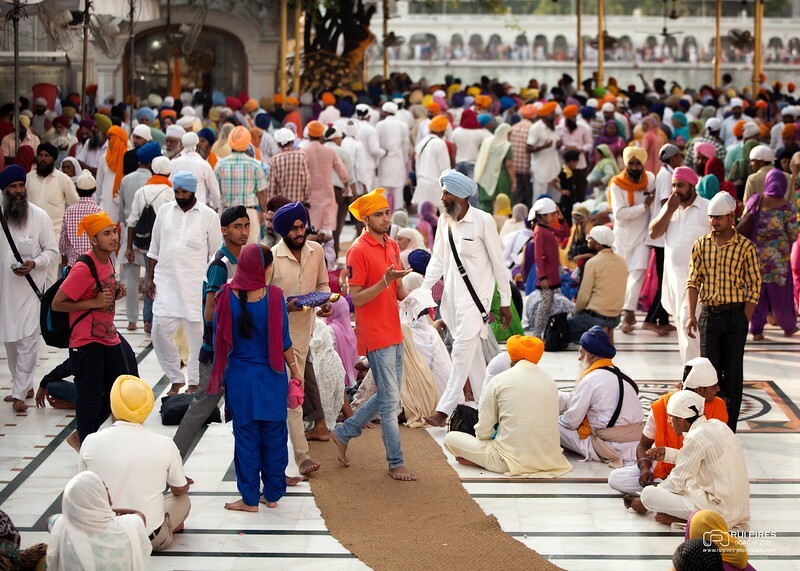 There are around 13 million Sikhs in the world today. Originating in the Punjab which was divided through partition in 1947, many have dispersed across northern India, to Europe, East Africa, Malaysia, Singapore, Canada and the U.S.A. 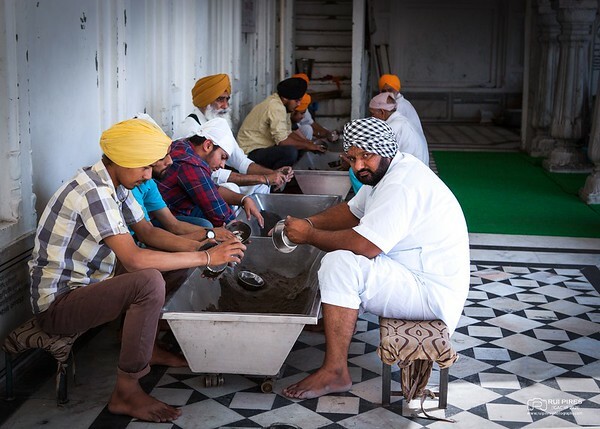 In India Sikhs have made a great impact as farmers, members of the armed forces and police, as well as in sport, transport, industry and education. On the latter, Punjab state has four universities, with education free and compulsory to the age of 14. The impact of their beliefs also cannot be minimized - they stand against the caste system, child marriage, and the consumption of alcohol and tobacco; and for the remarriage of widows, and hospitality. The Sikhs are a varied people, with longstanding links to the Police and Army in India, to the professions and merchandise, and to farming. The earliest Sikhs in Britain made a living for themselves as doorstep salesmen. The community grew steadily during the 1950s, often with the husbands coming to create a new life before calling the family over. There was a sudden boom in emigration from the Punjab to Britain in the early l960s, as new immigration laws threatened to tighten up procedures considerably. In the l960s, Sikh communities grew in established locations. 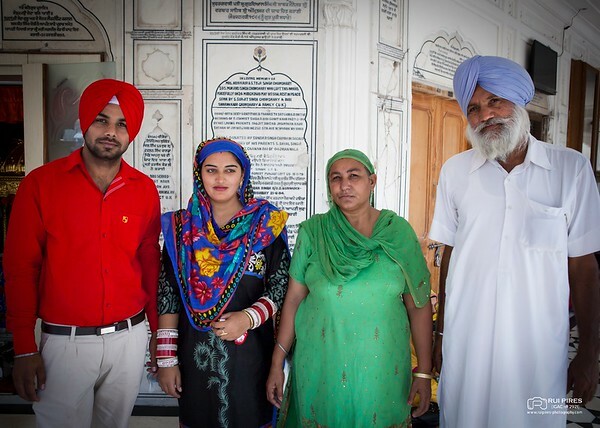 Since there is a strong family unit, families bought houses for its members, often close by other Sikh homes. A substantial sociological study of Sikh settlement in Gravesend, Kent was made by A W Helweg, Sikhs in Britain (1988). Britain at this time did not find the Sikh presence comfortable. The bitter resentment of many Sikhs focused upon the issue of motor cycle crash helmets, which were then made compulsory by law. The Sikh argument was that the compulsory wearing of crash helmets would force them to abandon their turbans if they wished to ride a motor cycle. They saw this as another example of their perspective not being respected. It was finally resolved by observing that head coverings do not have to be turbans. A later conflict also focused on the judicial hierarchy, after Lord Denning, one of the Law Lords stated that Sikhism was not a religion at all. During the l960s and 1970s, a number of Sikhs abandoned the outward form of their faith (the long hair, turbans particularly) simply in order to get a job and create a life in Britain. Towards the end of the 1970s, there was a greater tendency for Sikhs to remain with their faith, proud of its richness. The tendency now was for Sikhs to move out of their local enclaves in the inner city and spread into the wider community. 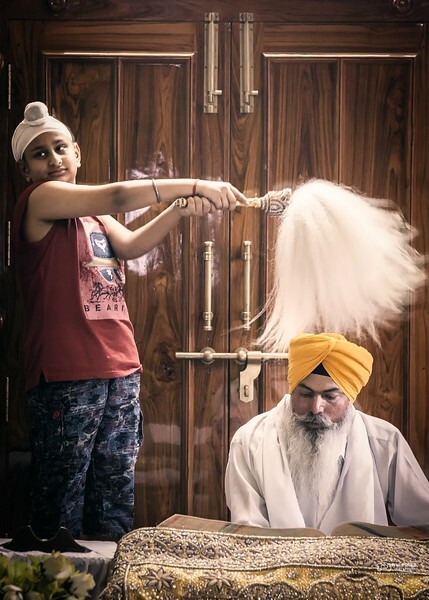 Today, Sikhs are found in all communities, professions and in all walks of life. They may or may not have decided to observe religious formalities. 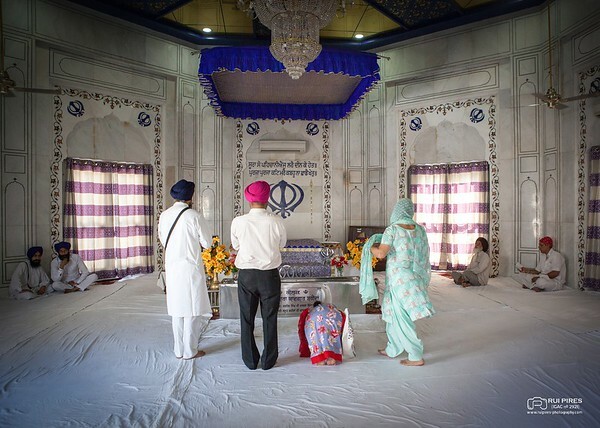 The Gurdwara, sometimes called Sikh Temple, is extremely welcoming to outsiders. The main formalities are to remove shoes before entering and for both sexes to cover their heads. 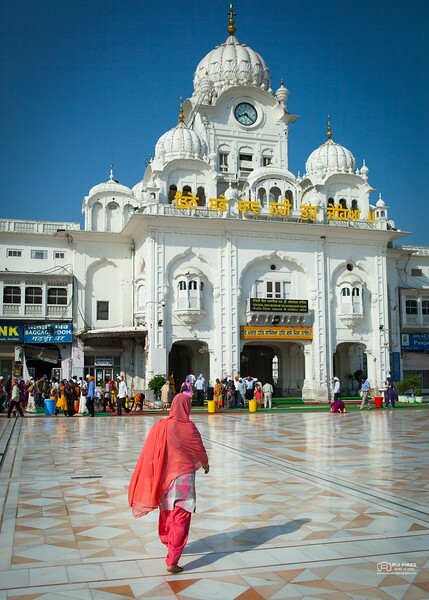 The word Gurdwara or Gurudwara means the "door or house of the Guru". In the days of the human gurus, the Gurdwara would be the place where Sikhs could come to seek advice and guidance from their leader. Since the death of the l0th Guru, Guru Gobind Singh (1708), the Gurdwara has instead housed the Holy Book containing writings of Sikh Gurus and earlier spiritual leaders. The Gurdwara is still however set up as though a human Guru is in residence - that is the book is treated as the human gurus may have been in their day. The sacred book is called the Guru Granth Sahib. It is placed at the front of the prayer hall on a throne covered with a canopy. Its presence is dignified by the waving of the Chauri, made of Yak hair or similar material. Close by will be a kitchen and dining room, the latter called the Langar. The Langar or free kitchen is available to anyone inside or outside of the community. It symbolises the need to share and stresses that no-one should be too proud to share their food with other people. In many cities the free kitchen for down and outs is a form of Sikh service to the British community. The Gurdwara will also obtain a bedroom, often on an upper floor. 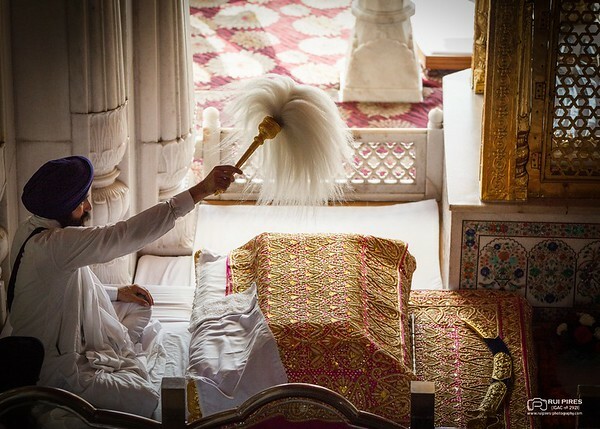 The Guru Granth Sahib is reverentially placed on a four poster bed for the night after evening prayers and brought down again next morning in a similar way. 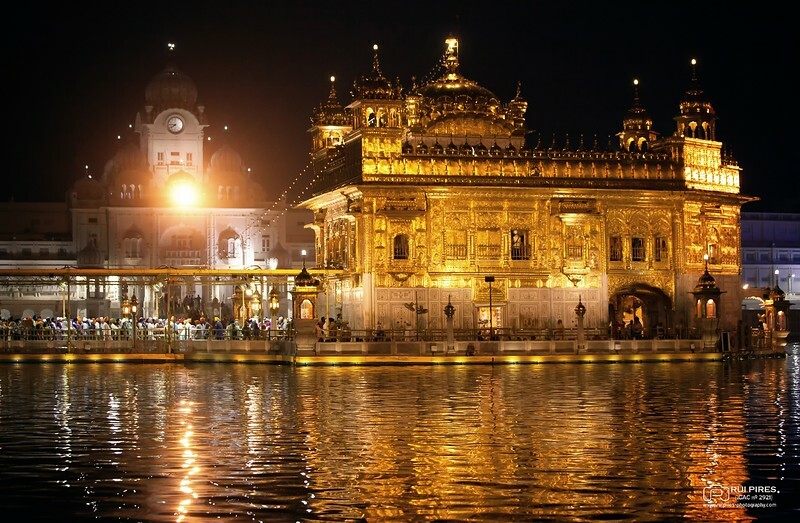 The Golden Temple is the tourist name for the Darbar Sahib or Harmandir. 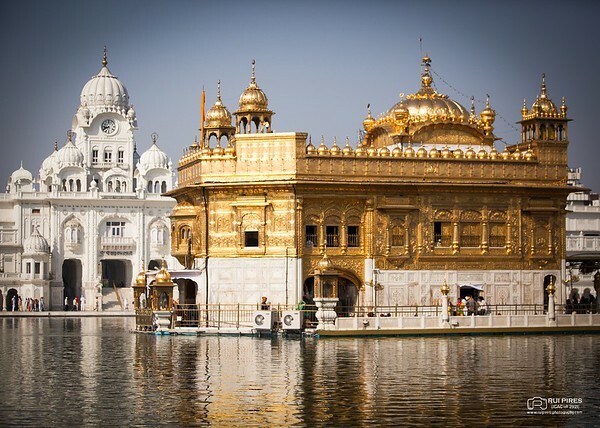 Darbar Sahib means the place where the Lord holds his Court and Harmandir means the House of God. 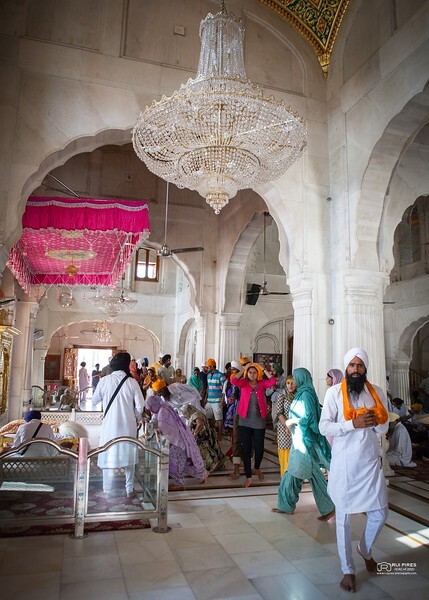 For a long time the Sikhs had no holy places, no cities or shrines which they visited as Christians sometimes go to Jerusalem and Bethlehem, or Muslims make pilgrimage to Mecca. In fact, the Gurus always said "God lives inside us, why search for him in holy places?" In spite of this the fifth Guru, Arjan, decided to build the Harmandir. The foundation stone was laid by a Muslim, Main Mir, and the building was completed in 1604. However, the story goes much farther back than that. Just over 400 years ago, in a place in the Punjab, not far from Amritsar, in a village called Goindwal, an emperor visited a guru. The emperor was the mighty Akbar the Great, Mogul ruler of most of India. He ruled India well and tried to keep the peace among his many millions of subjects with their various languages and different religions. He was a Muslim, and his queen was a Hindu. Christian Jesuits, and Sikhs frequently visited his court. Emperor Akbar had heard of Guru Amar Das and on a journey to Lahore decided to pass through Goindwal in order to meet him. When he came to the Guru's home he was surprised to see a large number of men and women, outside, sitting in rows, shaded from the sun by trees or canopies, eating together. In India people of different castes will not always share food. It was strange to see brahmins eating with sudras or people of other religions, such as Muslim or Sikhs. The Emperor was told that eating together was the custom. The Guru taught that all men were brothers. Everyone was equal so everyone should share the same food and eat it in the same place. If the Emperor wished to see the Guru he would first have to sit on the ground with everyone else and share a meal! This he did. When he eventually did see the Guru, the Emperor told him how important he thought the langar (free kitchen) was. Travellers and poor people for miles around came to it and none went away hungry. He offered the Guru some local villages which he owned so that the taxes from them could provide food for the kitchen. The Guru refused. The langar must be supported by voluntary work, sewa . "Each day's collections are spent the same day, and for tomorrow I trust in God", said Amar Das. The Emperor then asked if he could give the land to the Guru's daughter. According to some Sikhs this offer was also refused, but others say that it was accepted and that the town which grew up on this land became Amritsar, the city of nectar. To provide a water supply and a pool for ritual washing the Guru's son-in-law Jetha dug a large tank. 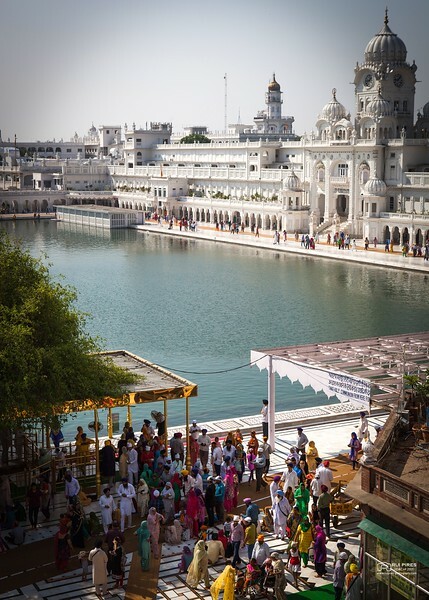 On an artificial island in the centre of this pool the Darbar Sahib or Golden Temple now stands. The original building was destroyed in a war between the Sikhs and the Moguls but a number of things are known about it. It was about 40 metres by 30 metres. Unlike a Hindu mandir (temple) it had four doors, facing in each direction, open to everyone, not one only to the east. Another difference from a Hindu mandir, and most Christian churches, was that to enter it one had to go down a few steps rather than climb some. No matter how lowly a person is he must become even more humble to meet God in the Darbar Sahib, Guru Arjan taught. The tenth guru, Guru Gobind Singh would not appoint another human Guru after his death, but indicated that the scriptures, the Adi Granth, would be Guru in his place. He gave the Adi Granth the title Guru Granth Sahib. The Adi Granth had been compiled in Pabjabi mainly from writiings of various Gurus, although there are some passages written by Muslim and Hindu writers. 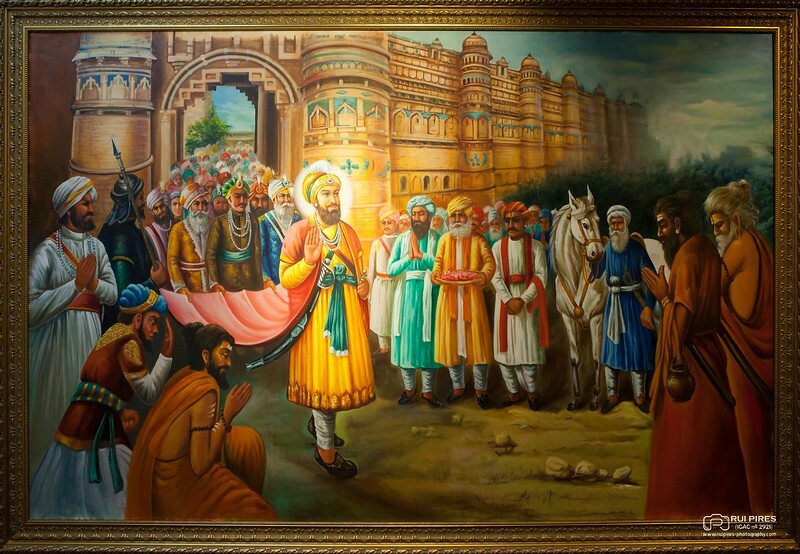 The first collection was made in 1604 by Guru Arjan, and added to by the tenth Guru, Guru Gobind Singh. Every copy should have 1430 pages, and contain 5,894 shabads (hymns) arranged into 31 ragas (musical measures). The book is shown the greatest respect, kept in an honoured place in the gurdwara, read on all occasions either by a granthi or a volunteer, and carried in occasional procession through the streets.